Located near Route 3 in Secaucus, NJ, 4 miles from Times Square the Holiday Inn Secaucus Meadowlands is nestled within Harmon Meadows Office complex with corporate headquarters, 23 restaurants & LA Fitness. Adjacent to the Meadowlands Expo Center. The Hilton Garden Inn Secaucus/Meadowlands hotel in New Jersey is 3 miles from Manhattan and is 15 mile drive from the Newark International Airport. The hotel offers 124 rooms, and meeting facilities of 2,300 sq ft with a capacity for 100 people. Extended StayAmerica Secaucus - Meadowlands hotel is designed especially for longer stays with studios featuring fully-equipped kitchens and plenty of work space... amenities you won't find in a typical hotel room. Residence Inn Secaucus Meadowlands is located in New Jersey. Our hotel features comfortable guest rooms and all standard amenities for your stay. Guests will enjoy easy access to all the nearby local area attractions. Red Roof PLUS+ Secaucus Meadowlands New Jersey is just a 5 minute drive to the Meadowlands Sports Complex - home of the NY Giants and NY Jets, IZOD Arena, Meadowlands Racetrack and minutes to the Meadowlands Expo Center and Lincoln Tunnel. The center offers 61,000 sq ft of exhibit space with 5 additional meeting rooms and a banquet capacity of 5000. Meadowlands Exposition Center is minutes away from New York City, Newark Liberty International Airport and six major hotels. The Bonefish Grill - Secaucus is located at 200 Mill Creek Drive in Secaucus. Plan your next event at Bonefish Grill Secaucus . We accommodate large parties and are happy to work together to develop a menu that is perfect for the occasion. Urban Plum is located at Plaza Drive, Secaucus in New Jersey. We can accommodate 60 People for Birthday Party, Anniversary or Corporate Event. Hyatt Place Secaucus/Meadowlands is ideally located just four miles from Manhattan and two miles from the New Meadowlands Stadium and the Meadowlands Sports Complex. All the excitement of the Meadowlands is less than three miles. Homestead Meadowlands / Secaucus is designed especially for longer stays with studio suite rooms featuring a fully-equipped kitchen and something you won’t find in a typical hotel. Courtyard Secaucus Meadowlands Hotel provides greater flexibility and choices for our guests. Located in the Harmon Meadow Corporate Park, our Secaucus, NJ hotel is convenient to Newark Airport (EWR), NJ TRANSIT Rail Station. Bareli's Restaurant is located in Secaucus, NJ and offers the most creative Italian/Continental Cuisine in New Jersey. We can accommodate up to 86 people. We are Available for Private Parties. 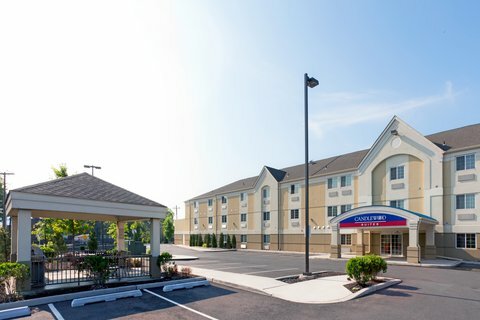 The La Quinta Inn & Suites Secaucus Meadowlands is ideally situated just 6 miles from Newark International Airport and only 4 miles from the excitement of mid-town Manhattan. Our suites are fully equipped to meet all your needs. Welcome to Candlewood Suites Secaucus - Meadowlands. Specialized in extended stay, Candlewood Suites is perfect for government (per diem), project teams, training, relocation, temporary and corporate housing needs.